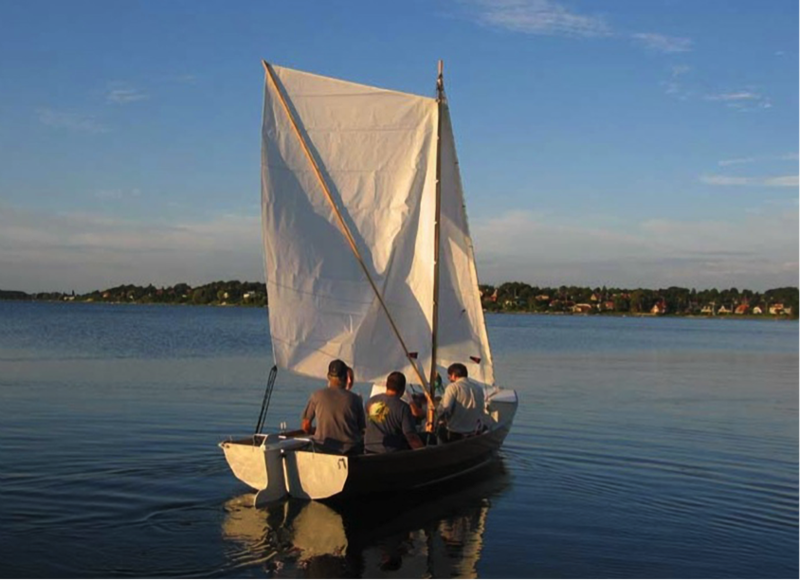 Over at Boatkits we have designed a new small lap strake dinghy. This nice little dinghy is given the name The Duckling. You can build the Duckling yourself since Boatkits deliver the boat as a kit. The kit is real easy to assemble so you can have the dinghy ready in a weekend. Take a look at the video from the maiden voyage. When it’s time to bond the inside corners of your boat, a fillet is generally the way to go. This can require the use of a special tool and a lot of patience. Or you can make them the easy way using ordinary, disposable plastic spoons. To create the curved shape, just use the back of the spoons. The spoons are sturdy enough to handle the thick epoxy. They are also durable enough to hold up without dissolving in the resin. Using disposable spoons makes cleanup easier, too! Watch this video and se the fillet process in action! It doesn’t always have to be a US boat type! Around Europe, there are talented designers creating boats inspired by their own local craft. From Denmark, Morten Olesen introduces his: 17′ Norwegian pram. In the last days of working sail, Denmark had a huge variety of boat types with local characteristics and aesthetics. Each of these types had been developed over generations and refined to suit the waters in which they were used. When I designed the 17′ Norwegian Pram, I took my starting point from a boat type used on one of the most inhospitable coasts of Denmark. Lying unprotected from the North Sea, the west coast of Denmark is mainly a flat sandy beach with two or three sand bars further out, running parallel to the coast, which are constantly scoured by strong currents. When the wind comes from the west, the seas are rough. It was in this environment that the predecessors of my 17′ Norwegian Pram were developed and used through the centuries. At that time, there were no harbors along the coast, which meant craft were launched and landed on the beach. Each day, boats would go out and return through the frequently violent surf. This demanding use developed really strong and seaworthy boats fishermen could rely on. The inspiration for the Norwegian Pram came to me one day when I was sitting in my favorite armchair recalling my younger days as an apprentice learning boatbuilding in a small town on the west coast. I built a lot of small boats back then but I remembered with most affection a secondhand GRP spritsail dinghy, which I’d bought cheap and restored. That boat, a small Norwegian pram, was a fine, fun boat. I left the armchair to look up Danish boats and soon found a type used on the northern part of the Danish west coast, which for reasons I could not discover, was known as a Norwegian Pram. Described as a strong boat, it was a good load carrier with full lines yet shallow draft; not a sprightly sailor but very seaworthy. All in all, a craft with some very nice properties, worth adapting for modern stitch-and-glue construction. I started work on the design right away; I have found many times before that when inspiration strikes like this, the whole design process goes faster. I had it all in my head; it was just a question of getting it down on paper. Using all I had learned studying naval architecture, I drew up the lines, comparing them with old photographs as I calculated the different coefficients and hydrostatic properties. With modern materials like plywood, epoxy and glass cloth, it is possible to build a boat lighter than it was back in the old days when they built in oak and larch, pine and spruce. The old prams were used for fishing, so had to carry much greater loads than a modern leisure version. The 17′ Norwegian Pram ended up with an LOA of 16′ 7” (5.05 m) and a beam of 5′ 4” (1.63 m). She draws only 10” (0.25 m) on a 992 lbs (450 kg) displacement with the centerboard raised and the hull weighs 242 lbs (110 kg) without mast and sails. Originally, boats like the Norwegian Pram were built with broad and thick lapstrake planks on substantial sawn frames but I redesigned the hull for multi- chine construction on plywood frames. Furthermore, I included double frames amidships to give better support to the thwarts and provide compartments for integral flotation or use as storage. It’s also worth mentioning that though I originally designed the hull with a daggerboard, constructing it with a pivoting centerboard is easy if that’s what’s preferred. I designed the Norwegian Pram with a stayed mast. This was not the case in the original craft but since using stays, the mast can be made lighter than an unstayed mast, I thought it would be an advantage. The sail area is 113 square feet (10.5 sqm), with some 81 square feet (7.5 sqm) in the boomless sprit-rigged mainsail. I am fond of the spritsail since it’s an easy sail to handle and quick to reef. The first 17′ Norwegian Pram was built in Denmark in 2006-7. The feedback from the builder was positive and the result was a beautiful boat that has given him many pleasant hours on the water. Another customer asked for a 15′ version of the Norwegian Pram that has also been a success… And I would not be surprised if a 19-20′ version is requested in the future. 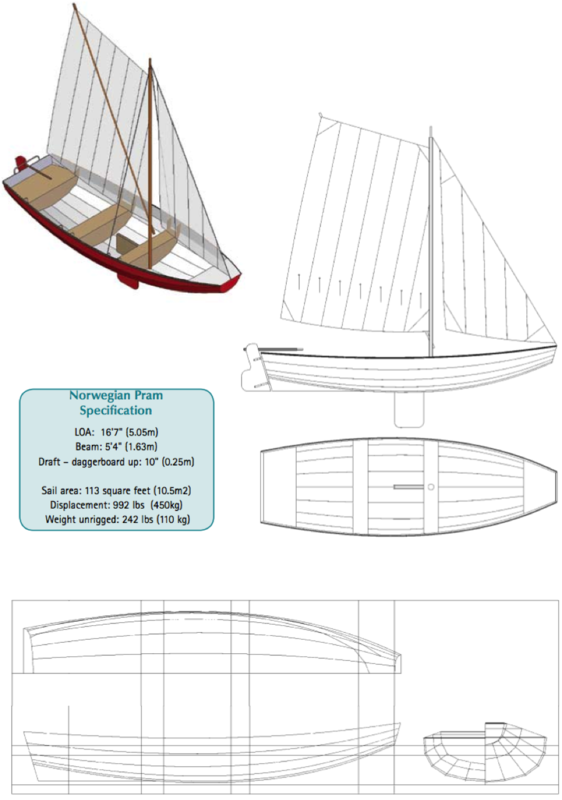 Downloadable boat plans for the 17′ Norwegian Pram and many more designs are available from http://www.boatplans.dk/. Part of the anticipation (and anxiety) of boatbuilding is not being able to see the finished product. Sure, design plans give you the dimensions and other specifications of the craft you’re constructing, but they don’t offer that all-important 3-dimensional view. Given a choice, what most boat builders (especially novices) prefer is the chance to actually see the finished boat before they begin the construction process. But how often does that happen? More often than you think! When you work with 3D boat plans, you have several advantages that help you speed up the building process and more. That’s because you get something extra in addition to traditional, paper boat plans. Three-dimensional boat plans come with paper plans or digital plans you can print yourself, plus a 3D computer model. This allows you to quickly glance over your entire virtual vessel, inside and out, before you ever make the first cut. This gives you an exact replica to follow, which can help walk you step-by-step through the entire process. Every detail is viewable including seams, fillets, joints and more. Decks, superstructures, masts, keels and rudders are available, too. It’s the next best thing to inspecting a physical boat. But looking isn’t all you can do. With 3D boat plans, you can also zoom in for closer inspection, pan cross sections to gain a clearer understanding and measure any part of the boat in both U.S. and metric units. Want to crawl underneath? You can, because 3D boat plans let you rotate your vessel in every direction, so nothing is out of your reach. Once you’ve gained access to your virtual finished boat, you’ll find the building process is greatly sped up. The visual aids you get from the 3D boat plans act as a roadmap that allows you greater freedom than when building from paper boat plans alone. And, because you can actually see the boat as you build, you’ll have greater confidence that you’re on the right track. TIP: Be sure to buy 3D boat plans that are compatible with both PC and Mac operating systems. Many will not function in a Mac environment. Boat plans that come with 3D capabilities also give you a chance to see your possible mistakes before you make them. It’s like getting a second chance or a “do over” without having the delays, frustration or added cost associated with trial-by-fire boatbuilding. If you’d rather have a step up from ordinary boat plans, look for 3D boat plans for your next project. The added flexibility and assurance they offer will speed up your completion time, reduce expenses and help you build a better-quality boat. Some time ago I build my own CNC router and the machine is running really good and manufacturing boat kits in an increasing pace. Not only is the CNC router running but I have also been able to find really competitive shipping prices for all over Europe. Therefore I am really happy to announce that I have launched Boatkits.eu that will be the website in English for the European boat kits market. Ohh by the way, do you want to see the new CNC router in action? Here is a video showing a test run of the machine.